Wow what a great time on Noosa Queen! So many thanks to Chris and Katie and to Gail for the absolutely fantastic Sunset cruise for St Vincent de Paul Coolum yesterday. Everyone is raving. If you haven’t been on this boat do yourself a favour you will love it. Chris is so accommodating and Gail never stops working and then there is the fabulous cruise. There is nothing like the beautiful Noosa River as a backdrop. The raves will continue for a long time. Thanks Thanks and Thanks. I can honestly not have enough praise for Chris and the team of the Noosa Queen. Our Wedding day could have not been any more stress free, and we and our guests could not have been looked after any better. 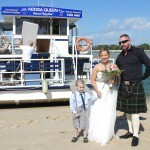 The team on the Noosa Queen made our day easy, fun and couldn’t do enough for us. Thank you from the bottom of our hearts for the perfect wedding day! We will be back for your Sunset Cruise and you have made customers for life. hello we recently hired the Noosa Queen for my daughter’s 18th birthday function. It was a fantastic day which all the guests thoroughly enjoyed. it was so nice to be on the water and let everyone relax, soak up the view and go for a swim. Would thoroughly recommend the boat to anyone. After living in the Noosa shire for just over three and a half years, it was our distinct pleasure to come on board the Noosa Queen River Cruise for the first time. Our young children certainly enjoyed the Lunch Cruise and once up on top of the upper deck they really got to see the Noosa River from a view that few people experience. Thank you and we look forward to seeing you again with more of our extended overseas guests soon. We had a great time on board the boat today. Thanks for the cruise, the beer and the food. My family & friends had the best afternoon aboard The NOOSA Queen. The atmosphere was excellent, The cruise is very well priced, the bar prices are great. The staff are extremely nice and made the cruise very Worth while, the sunset was awesome. We will be back again. Thanks so much Chris for a wonderful lunch cruise. Everyone is still talking about it ! We would recommend this to anyone. Great food, great everything !! 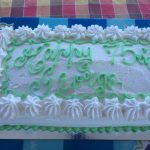 My friends and I celebrated our 30th birthday on the Noosa Queen and couldn’t rave about it more!. The staff (especially Chris and Gail) wet out of their way to create a relaxed and fun atmosphere. We have used their services before and will definitely use them in the future. Thanks again. Thank you for helping us celebrate my hubby’s birthday! Our 7 year old was so excited the entire trip and her visit with Chris at the wheel was a highlight.